2018-08-28 Tue Takehide Soh's sCOP won in two categories (sequential CSP and parallel CSP) at an international CSP solver competition (XCSP18). 2016-11-15 Tue We held 10th CSPSAT Seminar in Kobe. Thanks for the speakers and attendees. 2016-11-07 Mon IEEE-ICTAI 2016 will be held on November 7-9 in San Jose, USA. I will serve as a PC member for constraint programming and satisfiability. 2016-01-09 Sat Donald Knuth's new book is arrived! Our works are refereed in pages 100, 171, 264, 267, and 268. The order encoding is explained in pages 98–101, 114, 120, 170–173, 190, 268, and 281. 2015-12-11 Fri We released the following softwares. 2015-09-24 Thu I received the check from Professor Donald Knuth! Wow! 2015-11-09 Mon IEEE-ICTAI 2015 Special Track on SAT and CSP technologies will be held on November 9-11 2015 in Vietri sul Mare, Italy. I will serve as a PC member. 2015-04-13 Mon ACM SAC 2015 will be held on April 13-17, 2015 in Salamanca, Spain. I will serve as a PC member of the Track on Constraint Solving and Programming and Knowledge Representation and Reasoning. 2014-11-10 Mon IEEE-ICTAI 2014 Special Track on SAT and CSP technologies will be held on November 10-12 2014 in Chyprus. I will serve as a PC member. 2014-08-18 Mon ECAI 2014 will be held on August 18-22, 2014 in Prague, Czech Republic. I will serve as a Senior PC member. 2014-07-13 Sun PoS 2014 workshop will be held on July 13, 2014 in Vienna during the Vienna Summer of Logic. I will serve as a PC member. 2014-06-04 Wed FLOPS 2014 will be held on June 4-6, 2014 in Kanazawa, Japan. I will serve as a SC chair. 2014-03-24 Mon ACM SAC 2014 will be held on March 24-28, 2014 in Gyeongju, Korea. I will serve as a PC member of the Track on Constraint Solving and Programming. 2013-12-15 Sun LPAR 19 will be held on December 15-19, 2013 in Stellenbosch, South Africa. I will serve as a PC member. 2013-12-12 Thu Recently, I found a web page http://www.luschny.de/math/rulers/PrimeRulers.html by Peter Luschny in which he mentioned to my article "Complete List of Prime Number Rulers". Prime number ruler of length 18 is originally invented by the Institute of Fuben-eki System (organized by Hiroshi Kawakami of Kyoto University). A sequence of possible lengths of minimal prime number rulers is registered as A227956 of the On-Line Encyclopedia of Integer Sequences. 2013-11-04 Mon IEEE-ICTAI 2013 Special Track on SAT and CSP technologies will be held on November 4-6 2013 in Washington DC, USA. I will serve as a PC member. 2013-07-12 Fri GlueMiniSat solver developmed by Hidetomo Nabeshima (Yamanashi University) won the silver medal in "Sequential, Application, Certified UNSAT" track at SAT Competition 2013. 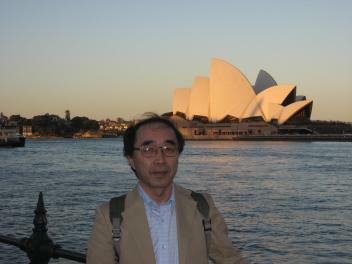 Hidetomo Nabeshima is a core member of CSPSAT project. 2013-07-12 Fri QMaxSAT solver by Miyuki Koshimura (Hasegawa Laboratory, Kyushu University) won the silver medal in Partial Max-SAT Industrial category at Eighth Max-SAT Evaluation. Miyuki Koshimura was a core memeber of CSPSAT project. 2013-07-08 Mon SAT 2013 conference will be held on July 8-12, 2013 in Helsinki, Finland. I will serve as a PC member. 2013-07-08 Mon PoS 2013 workshop will be held on July 8, 2013 in Helsinki, Finland. I will serve as a PC member. 2013-03-17 Sun Hiroshi Fujita (Hasegawa Laboratory, Kyushu University) updated the lower bound of Ramsey Number to 58 by using SAT technology (http://opal.inf.kyushu-u.ac.jp/~fujita/ramsey.html). Hiroshi Fujita was a core memeber of CSPSAT project. 2012-06-18 Mon QMaxSAT solver by Miyuki Koshimura (Hasegawa Laboratory, Kyushu University) became the winner in Partial Max-SAT Industrial and Crafted categories at Seventh Max-SAT Evaluation. Miyuki Koshimura was a core memeber of CSPSAT project. 2012-06-18 Mon ShinMaxSat solver by Kengo Honjo and Tomoya Tanjo ranked second in Partial Weighted Max-SAT Crafted category at Seventh Max-SAT Evaluation. They were members of our project. 2012-05-25 Fri We organized Eleventh International Symposium on Functional and Logic Programming (FLOPS 2012). 2011-08-05 Fri Prolog Cafe is used as a tool within Gerrit (Release notes for Gerrit 2.2.2). Gerrit is a web based code review system, and it is used in many software development projects, such as Android. 2011-07-01 Fri GlueMiniSat solver developmed by Hidetomo Nabeshima (Yamanashi University) became the winner in UNSAT Application category, and was ranked second in SAT+UNSAT Application category and UNSAT Application category (multicore track) at SAT competition 2011. Hidetomo Nabeshima is a core member of CSPSAT project. 2010-07-15 Thu I made an invited talk on Sugar at CICLOPS-WLPE 2010 (slide). 2010-04-19 Mon I made an invited talk on Sugar at FLOPS 2010 (slide). 2009-10-02 Fri Sugar became the winner in 3 categories at the 2009 International CSP Solver Competition. See the results page for more details. 2008-09-14 Sun Sugar became the winner in 4 categories at the 2008 International CSP and Max-CSP Solver Competitions. See the results page for more details.